Operation Masher was a combined U.S., ARVN, and ROKA operation that began on January 28, 1966. The name "Operation Masher" was changed to "Operation White Wing", because the name was deemed too crude for 'nation-building'. The mission was a search and destroy mission, and had little to do with nation-building. The operation was divided into four Phases. Masher/White Wing lasted 42 days and ended on March 6. As many as 1,342 enemy soldiers had been killed by the 1st Cavalry Division (Airmobile) at the cost of 288 United States' troops killed and 990 wounded. The ARVN and ROKA forces killed an additional 808 enemy soldiers. The 3rd NVA Division was pronounced destroyed, but later was back in action elsewhere on the battlefield. 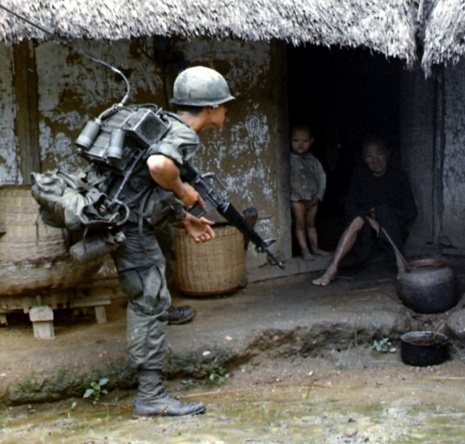 The purpose of the operation was to drive the North Vietnamese out of the province and destroy enemy supply areas. In late January, it became the first large unit operation conducted across corps boundaries when the cavalrymen linked up with Double Eagle, a U.S. Marine Corps operation intended to destroy the North Vietnamese 325A Division. Altogether, there were reported enemy casualties of 2,389 by the time the operation ended.